Composer and experimental pianist Anthony Davis will give a talk titled “Opera and Black Lives Matter: Music and Social Justice” on Monday, Sept. 26, in the Peter Graham Scholarly Commons at Bird Library. The talk, which begins at 5:30 p.m., is part of the 2016 African American Studies Colloquium, sponsored by the College of Arts and Science’s Department of African American Studies and with additional support from the college’s Department of Art and Music Histories. A professor of music at University of California-San Diego, Davis has been called pioneering and a “national treasure” by Opera News. His operatic works have focused on issues of racial injustice and the struggle for freedom in America. His first opera, “The Life and Times of Malcolm X,” traces the civil rights activist’s life from his early years as Malcolm Little from Lansing, Michigan, to his ministry in the Nation of Islam as Malcolm X and finally as el-Hajj Malik el Shabazz after his pilgrimage to Mecca. Its New York City debut has been called a watershed event for using opera as a medium for embracing the richness and complexity of black history and culture. “The music in the opera reflects the violence and torment of the time and the hope that Malcolm represented to the African American community,” Davis says of the work. “In the opera and in life, Malcolm was a truly heroic figure whose transformation as a thinker and activist remains an inspiration for everyone.” The music, he says, draws freely from the African American musical tradition, “transforming the European art form—opera—into a vibrantly subversive American idiom.” Its musical influences include jazz legends such as Duke Ellington, Billy Strayhorn, Charles Mingus, John Coltrane, Miles Davis and Thelonious Monk, as well as classical icons Wagner, Strauss and Stravinsky. Other subjects for his operas include the historic revolt on the slave ship Amistad and the 1974 kidnapping of Patricia Hearst. His latest work, FIVE, scheduled to premiere in November, revisits the arrest, trial and eventual vindication of the young men known as the Central Park Five, accused of attacking a young woman jogging in Central Park in 1989. The music is inspired by a range of African American musical expression, from Duke Ellington to Public Enemy. In addition to his operatic works, Davis has composed numerous works for orchestra and chamber ensemble commissioned by the San Francisco Symphony, Brooklyn Philharmonic, Atlanta Symphony Orchestra, Kansas City Symphony and others. 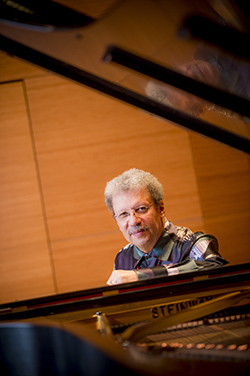 He has composed two choral works, including one based on the poem “Middle Passage” by Robert Hayden, that focuses on the harrowing “middle passage” of the slave trade that brought captive Africans to the Americas. Davis also composed the music for the critically acclaimed Broadway production of Tony Kushner’s “Angels in America: Millennium Approaches” (Part One) and “Perestroika” (Part Two). A graduate of Yale University, Davis received the Lift Every Voice Legacy Award from the National Opera Association in 2008 in recognition of his pioneering operatic works. He also has been recognized by the American Academy of Arts and Letters, the New York Foundation of the Arts, the National Endowment for the Arts and Opera America, among other groups, and in 2006 was awarded a fellowship from the John Simon Guggenheim Foundation. The Sept. 26 talk at Bird Library is free and open to the public.